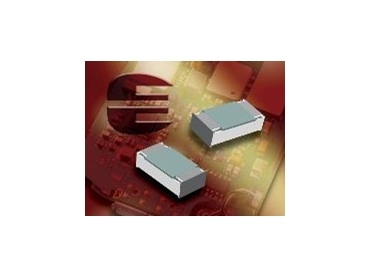 Resistance values up to 2M&Omega;. VISHAY Intertechnology, represented by Braemac , has extended its family of Vishay Beyschlag thin film flat chip resistors by introducing devices in 0402, 0603, 0805 and 1206 packages with resistance value up to 221kΩ, 511kΩ, 1.5MΩ, and 2.0MΩ respectively. The MCS 0402, MCT 0603, MCU 0805, and MCA 1206 resistors are aimed at applications that require extended value ranges with high stability and accuracy. All of the new devices meet the requirements of EN 140401-801, and extend the industry’s widest resistance range for CECC-compliant precision resistors with sizes down to 0402. Joining the MCS 0402 series, which includes resistance values from 100Ω to 211kΩ and rated power dissipation of 0.063W, the MCT 0603 series has resistance values from 39Ω to 511kΩ and rated power dissipation of 0.1W; the MCU 0805 series has resistance values from 39Ω to 1.5MΩ and rated power dissipation of 0.125W; and the MCA 1206 series has resistance values from 39Ω to 2.0MΩ and rated power dissipation of 0.25W. Characteristics include tolerances of 0.1% or 0.25%, superior overall stability (class 0.1 and 0.25), and TCR ratings from 25ppm/K down to just 10 ppm/K. The new devices are available in voltage ratings from 12.5V to 200V, and maximum permissible film temperature is 125°C. The new Vishay Beyschlag resistors have an ultra-stable thin film resistive layer and high-quality contacts between the resistive and conductive layers, and are manufactured using a proprietary laser trimming technique. By extending the range of available resistances in small surface-mount packages, these resistors address the needs of applications including automotive drivetrain controls, sensors and safety functions, telematics, and GPS. Other relevant applications include energy management equipment, precision metrology, remote sensing and metering, broadband telecommunications including 3G mobile systems, aerospace systems, industrial controls, medical instruments, and consumer and professional audio equipment. All of the resistors are compatible with tin/lead (Sn/Pb) and lead (Pb)-free soldering processes, allowing use by all assemblers transitioning to lead (Pb)-free processes to meet incoming legislation and voluntary environmental manufacturing codes in major territories worldwide. In addition, all devices comply with EU directives on vehicle end of life, including 2000/53/EC End of Vehicle Life Directive (ELV) and 2000/53/EC Annex II to End of Vehicle Life Directive (ELV II). All devices also meet 2002/95/EC Restriction of the use of Hazardous Substances Directive (RoHS) and 2002/96/EC Waste Electrical and Electronic Equipment Directive (WEEE).